Picture this. Kids at home for Xmas holiday. Indeed, it’s after Xmas. All gifts have been opened couple of days ago and everybody’s content. It’s dusk and it’s snowed today. Beautiful to look but too cold to play. The tablecloth is bright red on the table. The family sitting around. The Monopoly game ready to start. What’s missing? The recipe from allrecipes. Best cocoa. It’s officially our hot cocoa family recipe. How to make: In a saucepan, mix the cocoa, sugar and pinch of salt. Add the boiling water. Bring to boil at low heat. Simmer and stir for couple of minutes. No more. Add 3 1/2 cups of milk and heat until very hot, but do not boil! Remove from heat and add vanilla. Serve in mugs. Now, to the chantilly. Beat the cold heavy cream until peaks are formed. Add the confectioner’s sugar. Beat a little more to blend it in. 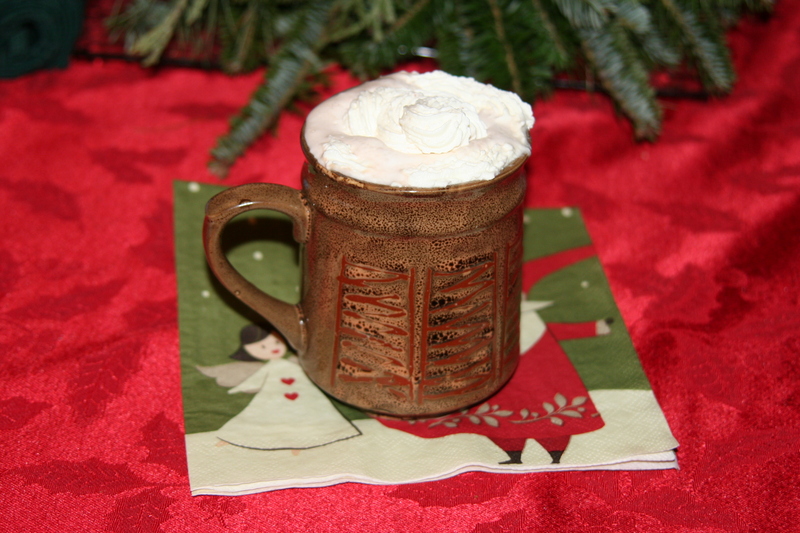 Top the cocoa with a blob of chantilly. Divine. Notes and tips: I bumped into this real mom kitchen post and had fun reading about all the variations. Worth a read. I LOVED the hot cocoa you made!!!!! !